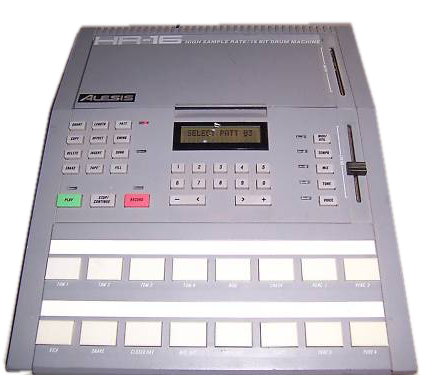 The HR-16 is digital sample playback drum machine from 1987 which features 49 sounds, a big step up in the number of sounds in a drum machine available at that time which was usually just only one kit of 16 sounds. However, kits are stored in each pattern. Therefore, each pattern stores the sound, tuning, and level for each sounds. It can play 16 sounds at once. It is possible to assign more than one sound to a pad to create more complex sounds. The memory can hold 100 patterns which can be link in up to 100 songs. The 49 16-bit samples included 10 bass drums, 7 snares, 5 toms, 2 open hihats, 1 closed hat, 3 cymbals, a Hi and Low congas, 2 woodblocks, 2 maracas, 2 cowbells, a claves, a cabasa, a shaker, an agogo, a triangle, a tambourine, a handclaps, a finger snap and a side stick. It was used on the track Rock Wit'cha by Bobby Brown. It was also used in early Autechre and Orbital tracks. Watch a demo here.